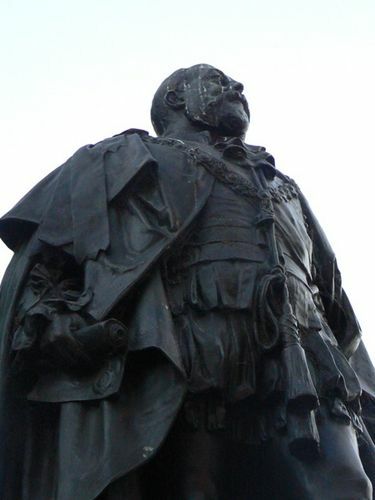 The statue commemorates King Edward VII. Edward VII (9 November 1841 – 6 May 1910) was King of the United Kingdom and the British Dominions and Emperor of India from 22 January 1901 until his death. A meeting of the King Edward statue fund committee was held yesterday. The hon. secretary reported that a deputation from the conmmittee had waited on the Premier and asked if the Government would provide a pedestal for the statue on the committee undertaking to find the money nesessary for the statue itself, and that the Premier had expressed his willingness to recommend the matter to the Cabinet. The amount the committee have in hand was stated by the secretary to be about £690. The Mayor reported for the sub-committee that the prices of designs ranged from £800 to £4000. They had decided to recommend the acceptance of an offer by Mr. Leonard Tennings, sculptor of Chelsea, London, to execute a replica of the statue of King Edward designed by him for erection at Bangalore, India, for the sum of £800. This was, he thought, the only design within their means. Empire Day will be observed in Hobart today with the usual ceremonies at the State Schools, when addresses will be delivered by various speakers and the children will render patriotic songs and salute the Union Jack. During the morning the scholars will have special lessons dealing with the Empire, and in the afternoon will take part in the unveiling of the King Edward memorial statue. The Mercury (Hobart) , 24th May 1922. REX et IMP. 1901 - 1910.